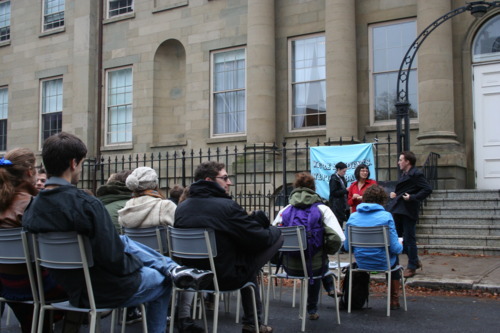 Students gathered around Province House on Granville Street to warn about the threat of rising tuition fees. The Take Your MLAs Back To School event, run by the Canadian Federation of Students Nova Scotia (CFSNS), set up a mock classroom outside of Province House so students could listen to Laura Penny, a professor who has taught at Dalhousie and King’s among other Nova Scotia schools, talk about the need to lower tuition fees. A group of students gathered outside in the rain to listen to Penny talk. Elise Graham, Chair of CFSNS, said there were three things they were asking for: the government to increase funding, reduce tuition fees for all students, and increase the non-repayable financial assistance of student loans. She says currently students in Nova Scotia graduate with about $31,000 worth of student debt. Penny was called in to educate students at the event about how did we got here, where the money for education is going, and why investing in education matters. She said that according to a recent survey by the Canadian Payroll Association, 6 out of 10 Canadians live pay cheque to pay cheque and Canadians aged 18 to 34, 75 per cent of them would be in serious financial trouble if they missed one pay cheque. Bringing history into the lesson, she says in 1980 tuition fees made up 13 per cent of university operating budgets. By 1990, 80 per cent of university operating revenue still came from public funding. By 2007, that was down to 57 per cent and it’s only declined since. The main point of the event was to show that lowering tuition fees is the solution, not more assistance. She discussed how Harper was expanding the budget for Corrections Canada, which will use $9.5 billion of Canadian’s money to fund, despite the fact that overall crime rates in Canada have been decreasing over the last 30 years. “I weep to think of how many of degrees, research centres, and how much student loan amnesty those billions could buy,” she says. She used the new convention centre as a local example. The provincial and local government will be spending millions of dollars to fund a privately-owned convention centre, despite the fact that experts say the convention industry has been in steady decline for decades, she says. Graham says that this event is just the ground for many others to come and in February they will be hosting an even bigger event to get the MLAs attention.